MANILA, Philippines - Meralco lost Ranidel De Ocampo last Wednesday due to calf injury while Kelly Nabong is still out indefinitely due to suspension. 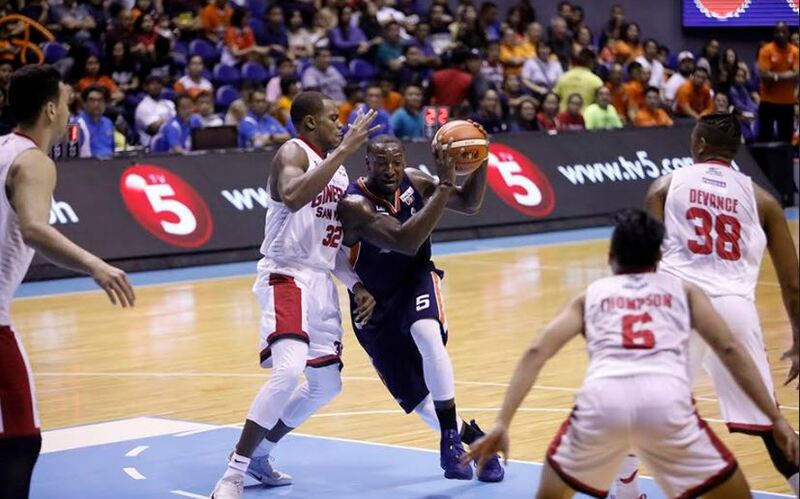 Still, Meralco led by Allen Durham and Chris Newsome got the win against Barangay Ginebra, 85-83 and levelled the series at 2-all on Friday, October 20 at the Smart Araneta Coliseum. Prior to game number 4, Coach Norman Black announced that newly acquired power forward Ranidel De Ocampo is out for the rest of the series due to a serious calf injury that he sustained in the previous game. RDO being out indefinitely means more woes for Meralco in the front court. This however leaves the door widely opened for Reynel Hugnatan to step up and carry the load. Hugnatan chipped in significant points in game 3 victory for the Bolts. Coach Tim Cone realized Meralco’s height disadvantage so he started the game with his twin towers Japeth Aguilar and Greg Slaughter. Meralco didn’t want to use its lack of big men as an excuse and didn’t let Ginebra run over the entire team. At the end of the 1st quarter, the Bolts amazingly tied the ballgame at 17-all. The Bolts didn’t miss De Ocampo’s hot shooting hands from the outside at all as supersub Reynel Hugnatan filled the void that he left especially at the rainbow territory. Hugnatan sank back-to-back treys for the 27-21 lead and forced Coach Cone to burn a timeout early in the second. Meralco escalated its lead to 8 points under 3 minutes of the half. But bad news came in, Justin Brownlee started to wax hot from the outside. During the 2-minute warning, Bolts’ lead was cut to just 3. Ginebra made a significant and scary run in the dying moments of the 1st half. But nevertheless, Meralco maintained its lead heading to the dugout. Justin Brownlee’s 17 points in the first 24 minutes brought Meralco’s lead to a half-shot, 41-40. Before the game started, the annual Leo Awards was held. As expected, San Miguel’s June Mar Fajardo bagged his 4th straight MVP award and cemented his PBA legacy together with Mon Fernandez and Alvin Patrimonio who both had 4 MVP titles during their heydays. For the other individual awards, Roger Pogoy won the Rookie of the Year award while Chris Ross was awarded with the Most Improved Player of the Year. The 15-minute powwow inside the Meralco locker room during the halftime break rejuvenated the players. As soon as the Bolts stepped on the hardwood, the players made sure that they will go ahead of Ginebra in terms of scoring. 52-44 midway of the third in favor of Meralco. Crushing the boards and forcing Ginebra to commit turnovers were the keys to success for Meralco’s run in the 3rd period. The Bolts hit the dozen-point lead at the 4-minute mark of the quarter while Mark Caguioa provided spark for the Gins and managed to cut the margin to a single-digit. Japeth Aguilar rocked the house down with a two-handed jam that trim the lead to just a shot. Unfortunately, Aguilar committed his 4th personal right after the highlight. But Jayjay Helterbrand got away with a steal and finished with a layup for the 70-all equalizer. It was still everybody's ball game with more than 2 minutes remaining in the game. Both teams traded baskets and tied the score at 78. Japeth Aguilar broke the deadlock with an alley-oop dunk to regain the lead, 81-78 with 1:54 left in the game clock. Under a minute of the game, Reynel Hugnatan located Allen Durham under the basket for a clean 2 and lead. Meralco was up, 85-83 with 40 ticks remaining. Ginebra had the chance to tie or win the game but missed all of its shots until the horn sounded. Allen Durham might be the highest pointer of his team but the Best Player of the Game award went to Chris Newsome for his brilliant comeback game with 18 markers and 11 boards. Crucial game number 5 will be on Sunday, October 22 where the winner will get a huge series advantage at the Philippine Arena at 6:30 pm.